Written by Catherine Saxelby on Monday, 06 May 2013. Sugar. It's been labelled "deadly", "addictive", "toxic", "sweet poison" and blamed for the rise in global obesity in recent years." Get rid of the white toxin from your diet and you'll free up your body to drop those excess kilos" (or so say anti-sugar campaigners Sarah Wilson, David Gillespie and Robert Lustig). Here are the three real reasons why I believe quitting sugar helps you lose weight. A level teaspoon of white sugar has only 70 kilojoules (16 Calories) but that's not the problem. It's not just the sugar. It's the company sugar keeps. If you eliminate sugar-laden foods, you eliminate a lot of kilojoules/Calories from fat and refined starches too. That's because we don't eat sugar on its own. We consume it with fat and refined starches (you can't bake a decent cake or biscuit without flour, fat and sugar). Think of shortbread biscuits. Yes there's 12 per cent added sugar but with that comes 29 per cent fat from the butter and 65 per cent of starch from the flour. The sugar isn't the key issue. It's just part of the wider problem of junk food. Take a look at what you'll save if you say "No" to soft drinks, energy drinks, chocolate biscuits, lollies, doughnuts and muffins. For instance, cut out just one can of fizzy drink and you cut out 555 kilojoules (130 calories) and 34 g sugar. Removing soft drink is a strategy often suggested to curb childhood obesity. Even reducing the volume of soft drink – as New York city has proposed with its ban on supersized cups and limiting a single serve to 500ml – can help. When you quit sugar you're cutting out foods nutritionists have always said you shouldn't eat. No lollies, chocolate biscuits, cup cakes, fizzy drinks, caramel frappucinnos or Magnums means you're removing "junk food" that is kilojoule (Calorie)-dense, of poor nutritional value, that comes in huge portions, is highly refined with added colours, flavours and preservatives. What's more it's usually low in fibre and has a high GI (not good). None of these foods is any loss in a healthy diet. You're better off without them. What these foods have in common is sugar. It's there for sweetness and flavour. And sugar does functional jobs like balancing acidity, preserving by preventing bad bacteria from growing and creating nice browning during baking. Just ask any chef. What do you replace sugary foods with? Usually it's more fruit and dried fruit (unless you're a "Sweet Poison" fan), nuts, salads, water or you just eat more chicken, fish meat and vegetables at your meals. Sounds pretty healthy to me. Here are my 9 simple swaps to limit your intake of sugar junk foods. distract yourself if it’s after dinner and you’re not hungry. e.g. macadamia, almond or cashew. Note: You can still eat a lot of kilojoules by eating fat and starch with salt. I call them salty fat. No sugar there. Watch how many potato crisps, corn chips or movie popcorn people wrap themselves around when no-one's watching. Check out the amount of gourmet cheese with crackers that is consumed after you've eaten dinner. Oh, and how could I not mention the tubs of hot chips or slabs of pizza at kids' parties? You don't have to quit sugar entirely to improve your health and your weight (as the anti-sugar campaigners insist). Moderation, as always, is the key to eating healthily, sensibly and in a way that is easy to maintain. 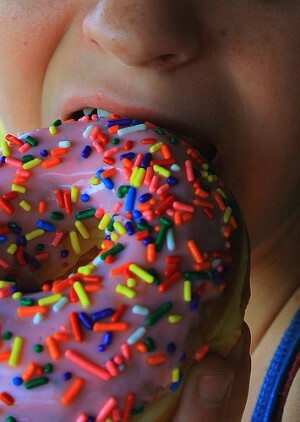 However, if you seriously want to lose weight, I do believe that eating less sugary junk food is a good thing to do. Write out your day's intake of food. Circle the sweet foods and drinks you like to consume regularly or in large amounts. The most likely culprits are soft drinks, juices, cordial, chocolate, muffins and confectionery. Or circle the sweet foods you reach for when you need a comfort fix. Cut out those. Remove the large amounts of sugar from your diet and don't worry about the little bits that make low-fat, high-fibre, foods palatable such as a sprinkle of brown sugar on porridge, a scrape of jam on grainy bread or a drizzle of honey on your unsweetened breakfast cereal. And don't stop eating fresh fruit. Agave – is it better than sugar? Sugar - are you sweet enough? 7 types of sugar - which is healthier? Honey - is it healthier than sugar? Are syrups better for you than sugar?